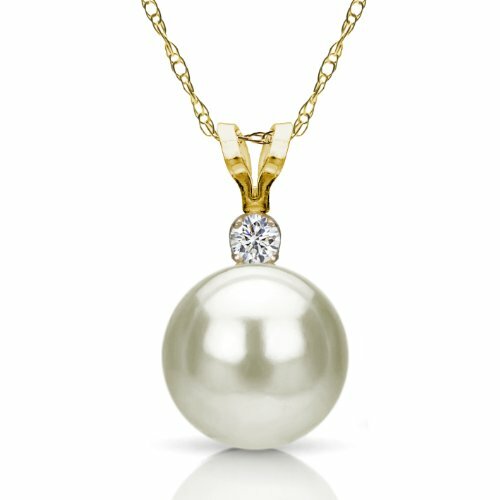 14k Yellow Gold 1/10cttw Diamond 10-10.5mm White Freshwater Cultured High Luster Pearl Pendant, 18"
A beautiful 14k Yellow Gold 10-10.5mm Hand-picked White Round Genuine Freshwater Cultured High Luster Pearl Pendant with .01tcw Diamond with 18" Chain Length Necklace. Please Contact Us If You Do Not See What You Need. Each pendant-necklace is affixed with the highest quality 14K gold clasp. The option is given to select either white or yellow gold based on your preferences. The pendant-necklace is packaged in a fine-looking La Regis' Jewelry Signature Gift Box with a tidy bow on top, which means you don't have to run to the store and hunt for wrapping paper. The box is sturdy and we take steps to ensure that the package stays intact during transit and arrives in perfect condition at your doorstep. Gold Plated I Love You Necklace 24k Gold Inscribed in 120 Languages on Blue Cubic Zirconia Pendant, 18"
925 Sterling Silver Heart Pendant Necklace I Love You 12 Languages 24k Gold Inscribed Clear Crystal, 18"